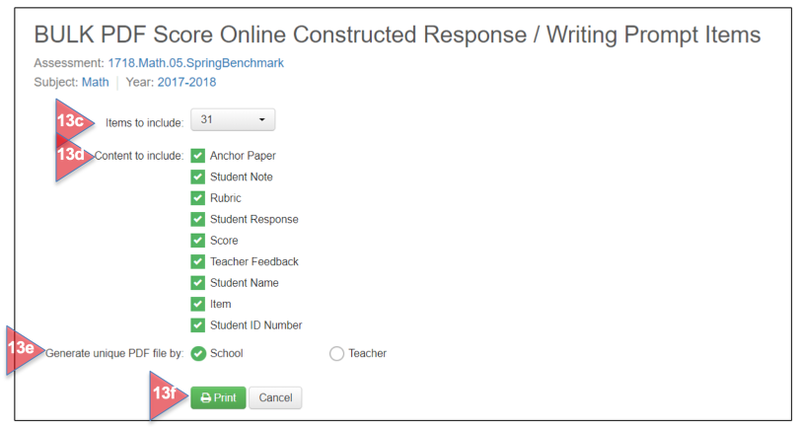 If an online Item Bank, AKO, or Express assessment includes one or more Constructed Response items, the students’ responses must be scored within SchoolCity SUITE. 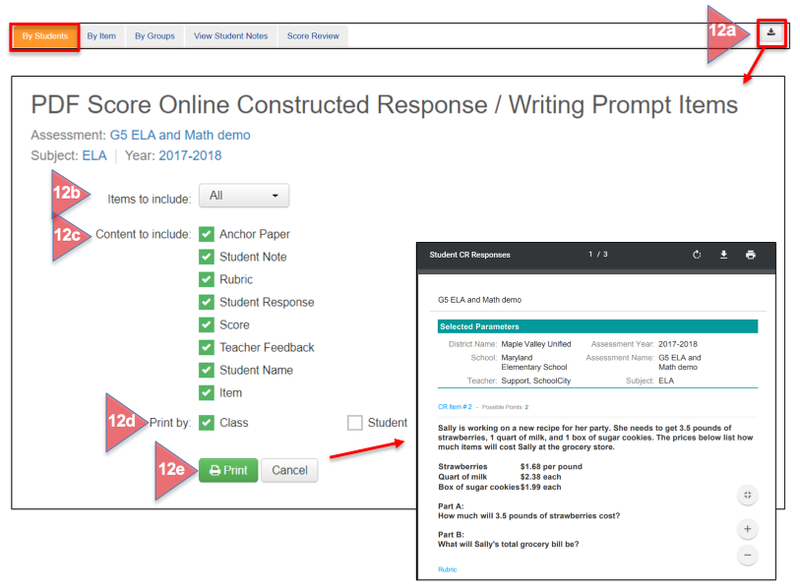 This document will explain how to score an online Constructed Response, how to print the students’ responses, and how students can review their score in the Student Portal. 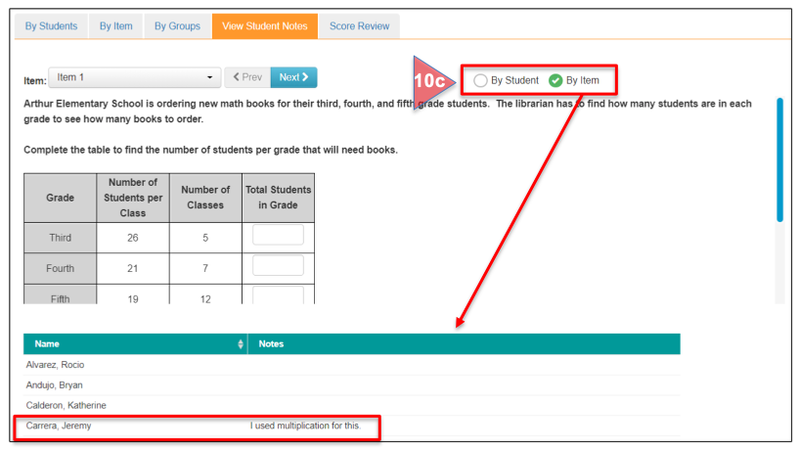 Or, from the SchoolCity Launchpad, select the SCORE or ONLINE Flip Card (1c). On the reverse side, select Score constructed response items. Find the assessment you wish to score or click on More to go to the Assessment Manager (1d). 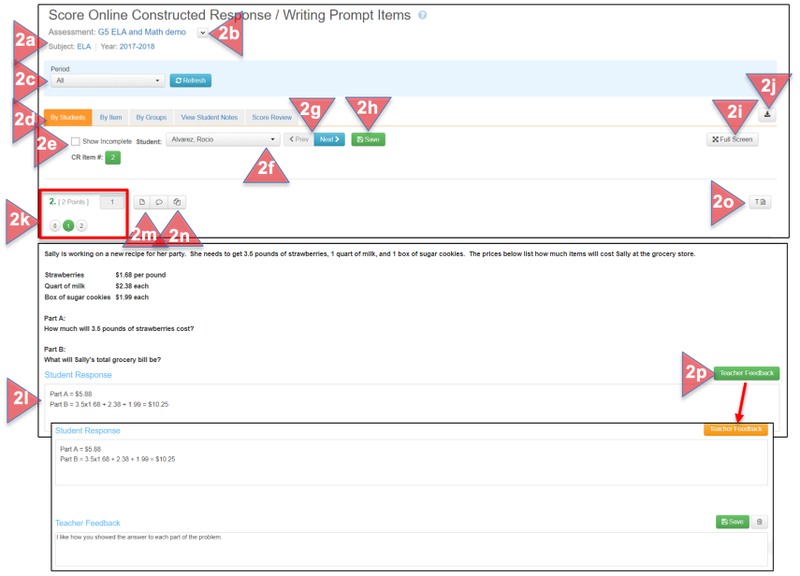 Tabs for score By Student (default setting), By Item (See Step 8), By Groups (See Step 9), View Student Notes (See Step 10), if any were made by students while testing, and Score Review (See Step 11), a preview of how students have performed on each assessment item. Download icon: Export Student Answers to PDF and print (See Steps 12-14). After reviewing the student’s response, click on the score number. It will change to green and the number will automatically appear in the points box. Depending on the assessment type, an Anchor Paper may be available to use as a scoring guide. 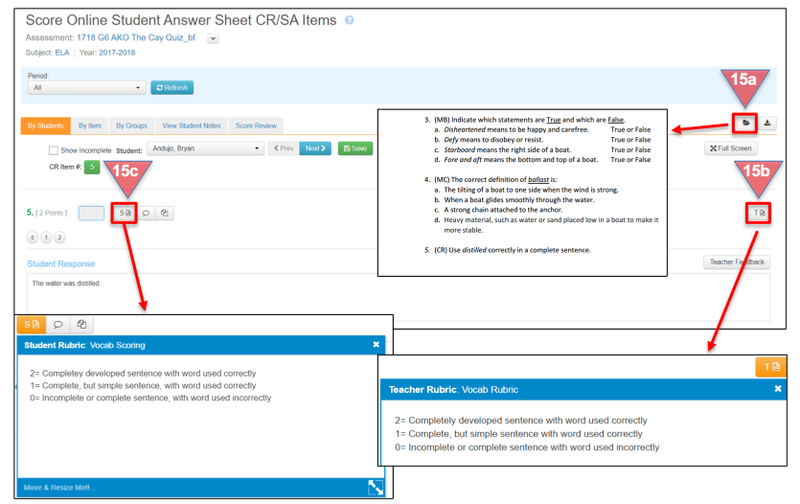 Students may write Notes for this item (if given as a tool by the Test Administrator) as they complete the Constructed Response in the Student Portal. Click on the appropriate icon to view each. 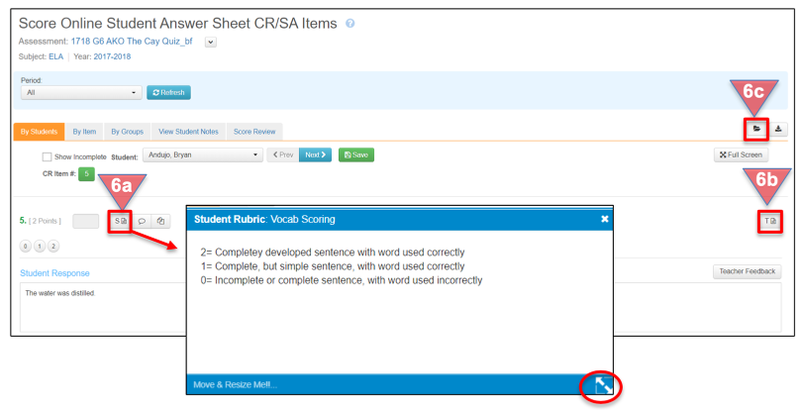 Student Rubric (optional): A student rubric may be uploaded during the assessment creation process. The window is resizable and movable. Teacher Rubric (optional): A teacher rubric may be uploaded during the assessment creation process. Test Document: The PDF of the assessment may be viewed by clicking on the open folder icon. Score points: Click on the appropriate score and it will automatically display in the score box. Anchor Paper, Notes, Copy to Feedback: See above for more information. Teacher Rubric and Anchor Paper. 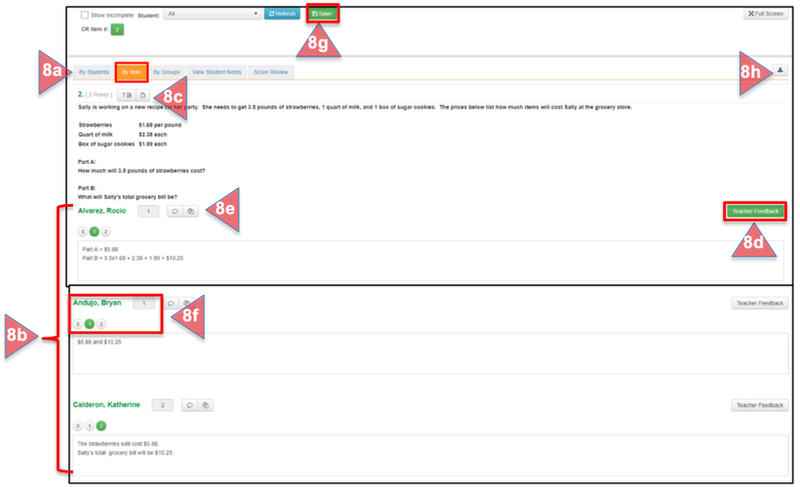 If student groups have been created in the Group Manager, a group may be selected for viewing. Student ID, Last Name, First Name, Items with score (0 = Incorrect, 1 or more = Correct), Total (points earned/points possible), Percent Correct (blue bar graph). If randomization was turned on for an item bank assessment, the items return to their original position for scoring. The CR item in the example below is Item #2. Hover over the item number to see the Item Type. Select Items to Include: All CR items (if more than one) or a specific CR item. Select Items to Include: all CR items or a specific CR item. Status/Delete: Each request displays the Requested By User Name, the requested date, the status, download icon, and delete icon. A new request displays as Received. 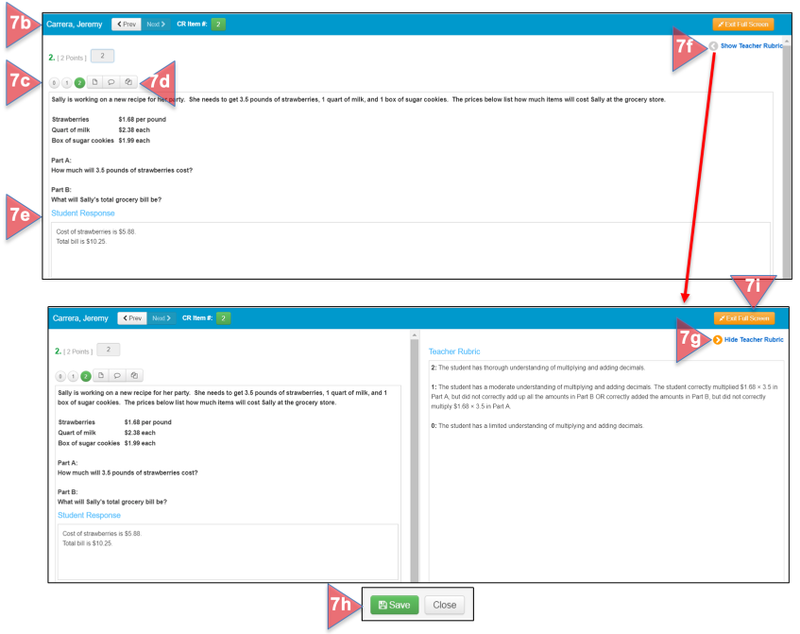 Student responses can also be downloaded and printed from the Assessment Manager, when the assessment window is In Progress (yellow) or is Closed (red). For Bulk Printing, click on the download icon. View the PDF of the assessment by clicking on the document icon (open folder). Teacher Rubric (optional): Created/uploaded by the author during the assessment creation process. Student Rubric (optional): Created/uploaded by the author during the assessment creation process. Students may view the rubric during the testing session. 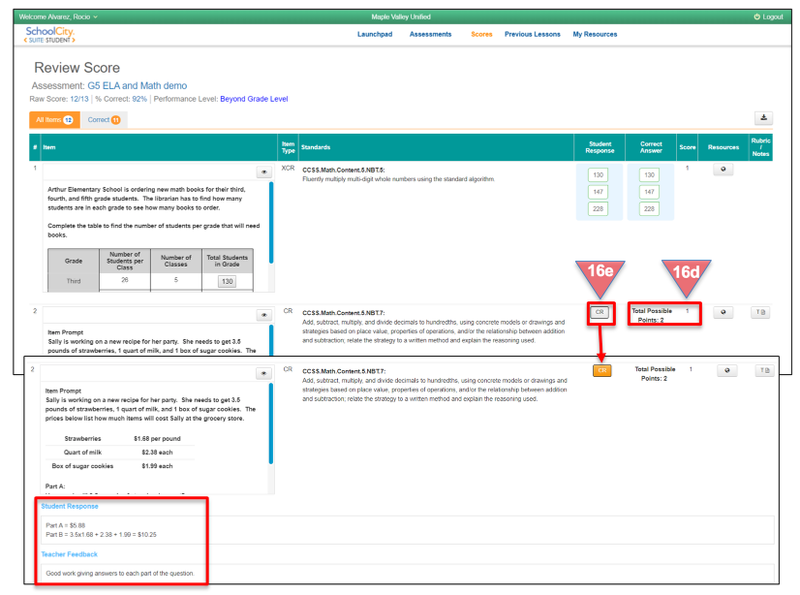 In Online Settings, if Show Item Details in Student Portal has been selected as a property for an assessment, then students may view the results of that assessment, including their score and Teacher Feedback for a Constructed Response item. Scroll down to the CR item, and view the score in the Score column. Click on CR in the Student Response column to view the response and any teacher feedback given.